The Porto Torres Propriano ferry route connects Sardinia with Corsica. 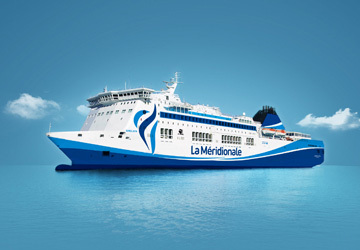 Currently there is just the 1 ferry company operating this ferry service, La Meridionale. The crossing operates up to 1 times each week with sailing durations from around 3 hours 30 minutes. Porto Torres Propriano sailing durations and frequency may vary from season to season so we’d advise doing a live check to get the most up to date information. Prices shown represent the average one way price paid by our customers. The most common booking on the Porto Torres Propriano route is a car and 2 passengers. The Italian city of Porto Torres is located on the north west coast of the island of Sardinia. It is roughly 25 km to the east of the Gorditanian promontory and also on the bay of the Gulf of Asinara. There are a number of things to see in the city, the most popular being the 11th century, three naved, Basilica of San Gavino which was built using only precious hardstones like marble, porphyry and granite, and is Sardinia's largest Romanesque church. Also popular are the Catacombs of Tanca Borgona which are man made underground passageways built for religious practice. It is the second best served port in Sardinia, after Olbia, and links the island to Genoa, with a crossing time of 11 hours and 30 minutes. There are also services to Civitavecchia (7 hours and 15 minutes, Barcelona (11 hours and 15 minutes), Ajaccio (3 hours and 30 minutes), Propriano ( 4 hours) and Marseille (17 hours). The French town of Propiano is located in the south west of the island of Corsica, at the head of the Valinco Gulf and to the north west of Sartene. The town's centre is a lovely place explore with many traditional houses which seem to have been taken over by cafes, bars and luxury shops. The town is now one of the most popular resorts in Corsica due to the many beaches that are nearby for visitors to enjoy, including the Plage de Lido which are around 1 km from the town. Many of the town's buildings date back to the early 19th century, when most of the town was built and is also when the port was established. Although the location of the town has been inhabited for centuries, including by the Romans and Greeks, little of early Propriano remains as it was often attacked and mostly destroyed during the 18th century. From the town's port ferry services operate to Marseille with a journey time of around 12 hours and 30 minutes.